I took my first steps on snowshoes yesterday. It didn’t feel like fourteen degrees at all. I might just go back and perfect my heart today; after all, it’s Sunday. 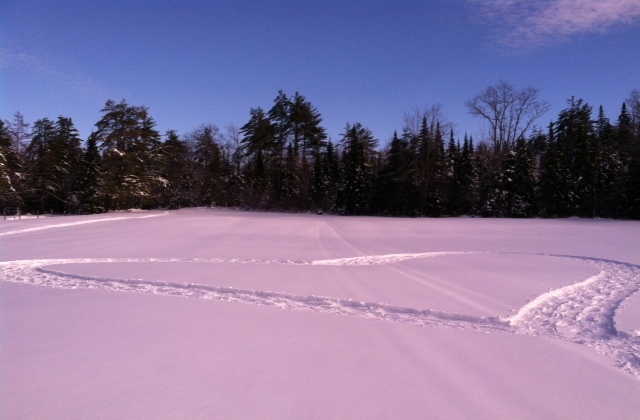 This entry was posted in Today We Rest and tagged bury my heart in Baumer's Field, snowshoes, winter is beautiful. Bookmark the permalink. There is nothing new under the sun or on the snow! Thank you for sharing! I was surprised by how physically taxing the snowshoes were, compared to cross-country skis. I think, in part, that’s because snowshoeing involves sinking deeper into the snow. On cross-country skis, one generally follows a trail and glides along. Both are good, I think, just different.